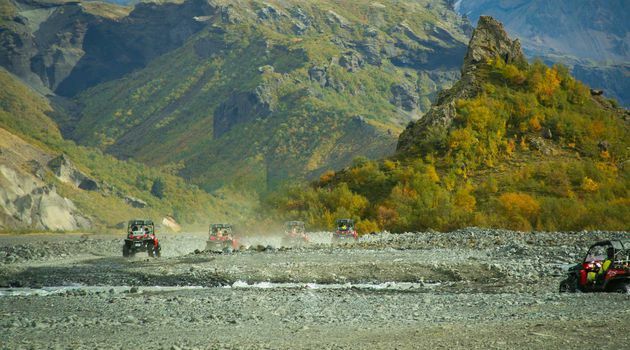 Thorsmork valley is an amazing place to visit, but to get there you must ford several rivers. This is not allowed with rental cars, so a guided tour is needed to access the area, so why not do it the most amazing way possible? Meet up with us at Nauthúsagil canyon, where you will be geared up in all the necessary gear to keep you comfortable on your buggy tour. After a short safety briefing, it is time to strap in to the 2-seat buggy and get going. The tour starts off easy with small fords and puddles, heading in to Gígjökull glacier. The glacier tongue is fast receding, so you might be one of the lucky few to still get a glimpse! Soon the rivers and fords become more technical and deeper, and a lot more fun! Stakkholtsgjá canyon is an amazing scenic stop, with a short hike into the gorge to a hidden waterfall. If the river is not too deep, we may even go all the way in to Básar cove, where you can go on another stunning hike, with an amazing view over the valley and the 3 glaciers that surround it. Once we return to Nauthúsagil, you will have seen and experienced things you will never forget! 4-5 hrs. guided Buggy tour (2 in each Buggy), helmets, gloves, balaclavas and water resistant overalls.